Second installment of me modeling the most exquisitely smelly rank pantyhose and worn shoes. The hosiery found itself a lucky foot sniffer already. 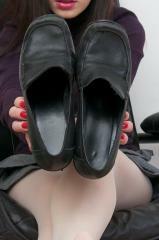 Hit up ebanned if you want the worn out Kenneth Cole reaction loafers filled with my heavenly foot stench and sweat. Showing 6 of 123 photos. To see all the photos please Sign Up.